“Skaði Hunting in the Mountains” by H.L.M. Ideally one would get everything perfect at the first try. Sometimes, however, the first choice isn’t quite right. Even though Skaði only began in 2009, by spring of 2010 we had started to outgrow our old business name. It failed to capture our passion for skiing, our originality, and our respect for the sport. Rather than trying to mold and suppress the company to fit the old name, we have chosen to rebrand the company as Skaði. Skaði is a goddess from Norse mythology. We’ll have more the say about the mythological figure of Skaði later. For now, we want to express how thrilled we are to have found a name and an icon that we can draw on for inspiration and for strength. 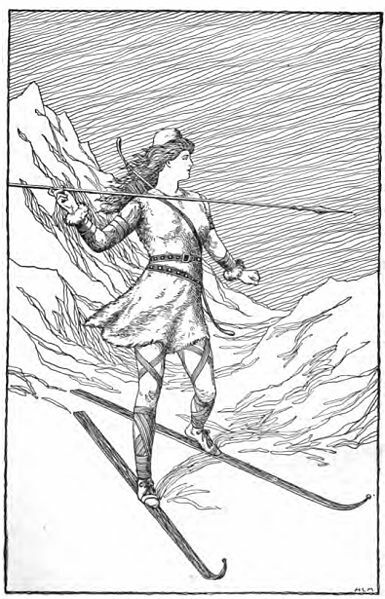 The skier Skaði is mysterious enough that today’s skiers can re-imagine her to be whatever they need her to be while being firmly rooted in Norse mythology and the history of skiing. We hope to honor her past while bringing her forward and into the awareness of the modern skiing community. If only the rest of the world shared the same interested I do… then nothing of any material value would ever be accomplished. Wait, maybe that’s not such a good thing. But, we’d all be healthy athletic scholars!